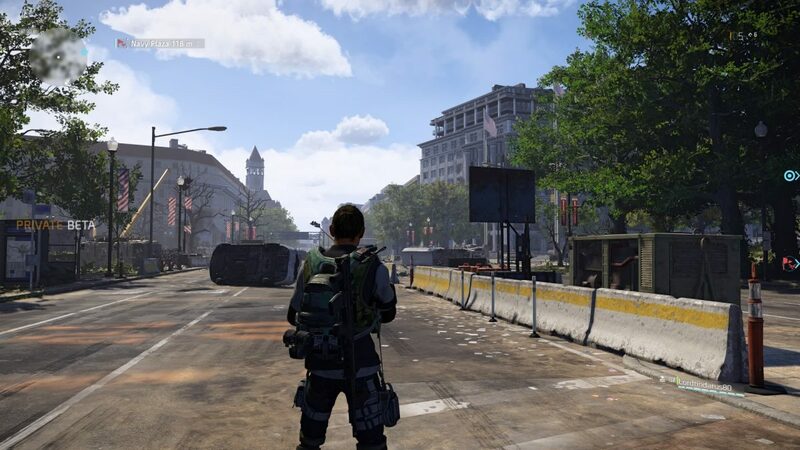 It has been a long weekend this one, entirely spent on playing The Division 2 Private Beta. 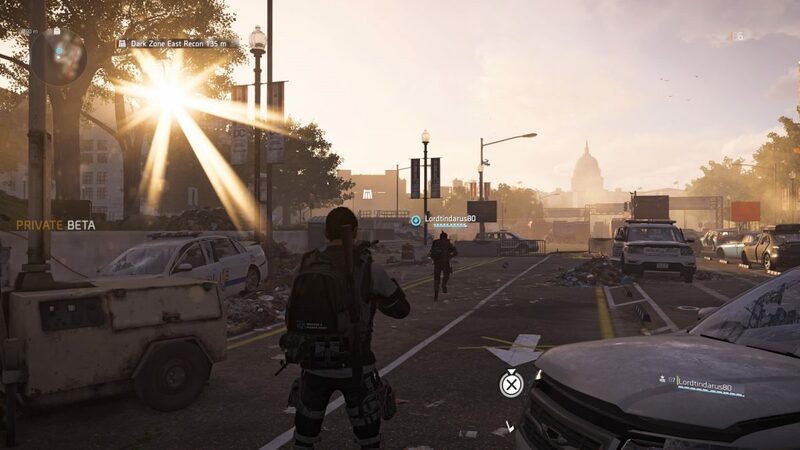 The first installment of this Ubisoft new IP came out three years ago and with over 200 hours of presence, it was, by far, the game I played the most in my entire gaming career. You can, therefore, imagine my hype when the sequel was announced, and how much I was waiting for this beta. So, without any further ado, let’s discover together how it went. 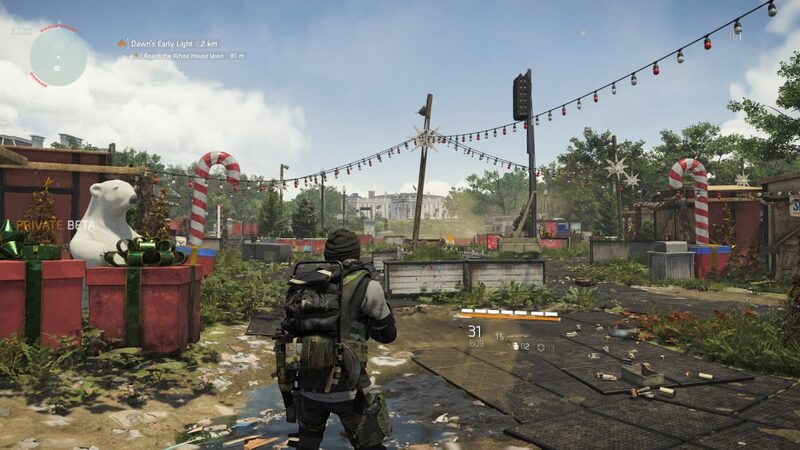 The first game was set in a fictitious New York City after a bacteriological attack was perpetrated during Christmas Holidays. 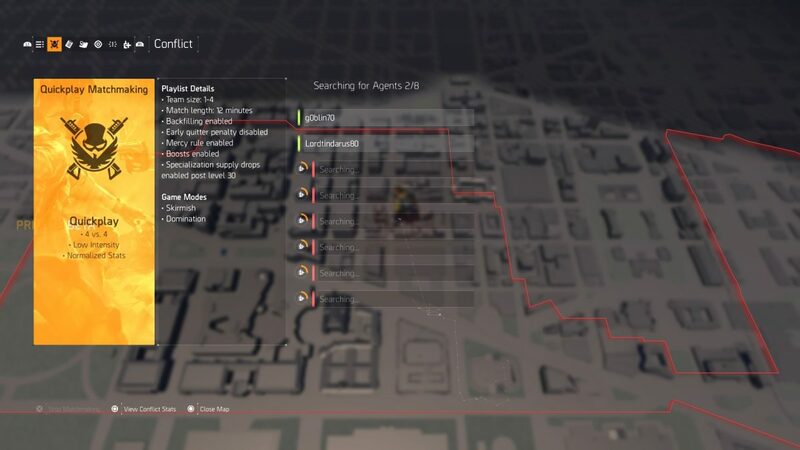 The first wave of Division agents went amiss during the first attempt in unveiling what caused the outbreak. 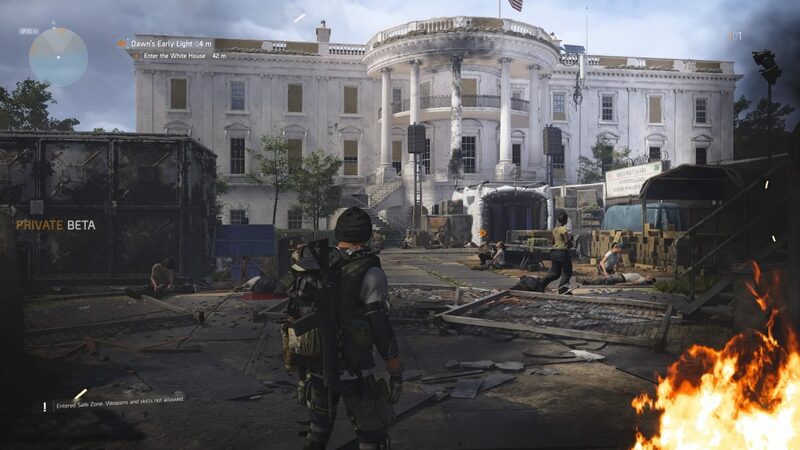 With New York safely taken back by the second wave, it is now Washington, D.C. turn to be saved from destruction. A few months have gone by, so the landscape has changed from snowy and cold winter time to a sunny and warm early summer period. 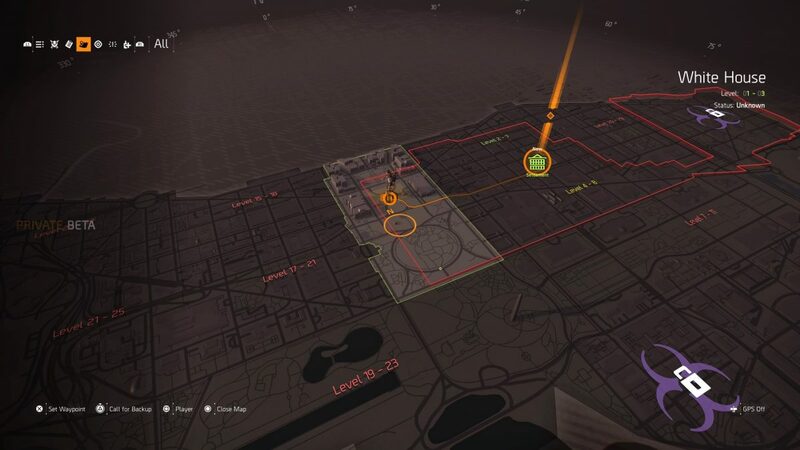 Your first assignment will be to reach the White House, now turned into The Division HQ. 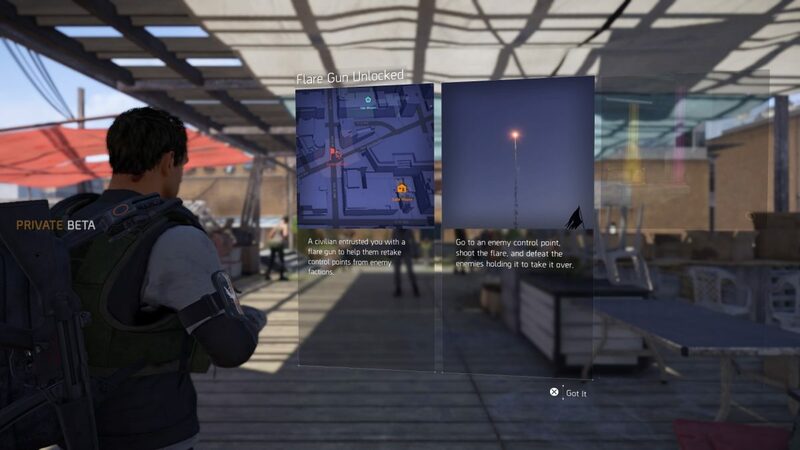 Here you can notice the first difference between this game and the previous chapter: while in the first game your HQ needed to be improved by activating various terminal and enabling their relevant characteristics, here improvements are automatically done upon main missions completion. 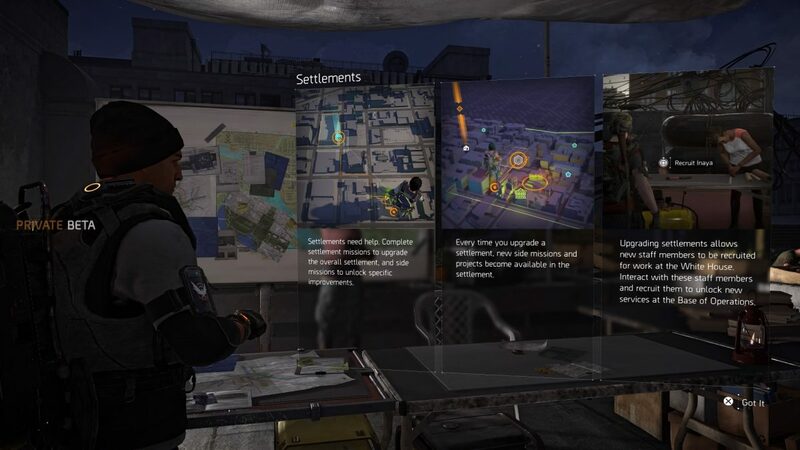 Nonetheless, a new interesting feature has been introduced: the Settlements. Those are actually residential areas where survivors have gathered to start a new life together, but to do it they will need you to complete projects and such. Such a feature is much more important than you may think at first. 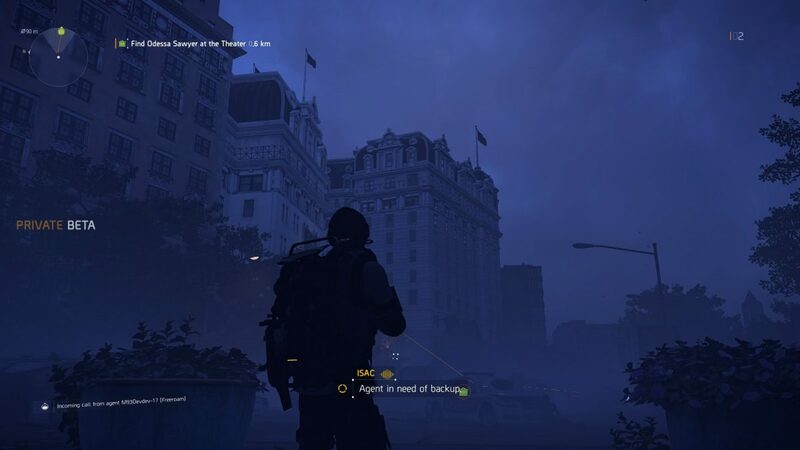 New York was an awesome scenario for the first game, but I always felt lonely inside it because interaction with NPGs was almost non-existent. Now streets burst with life, with people patrolling the neighborhood in a much consistent way than JTF battalions. 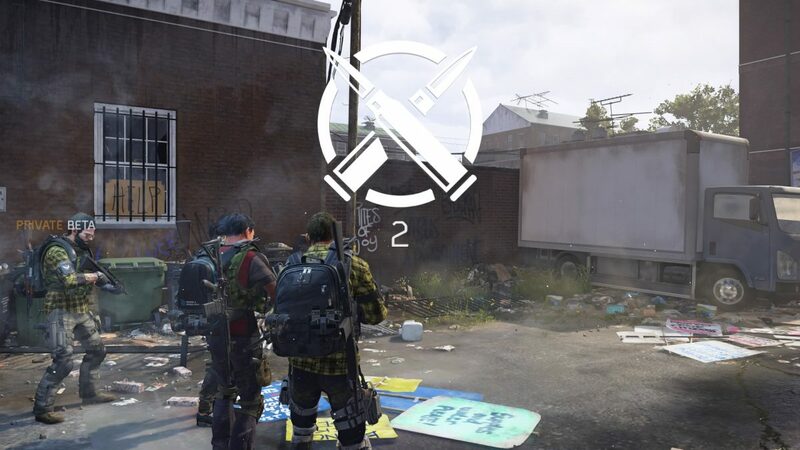 The Beta gave the opportunity to test some Skirmish, a very nice PvP experience that allows you to confront other human players without the stress of losing all your loot. This is pure combat, where developing a well-thought strategy is the key to success. The End Game part was accessible upon completing the main missions (after you reach Level 30, in the full game). 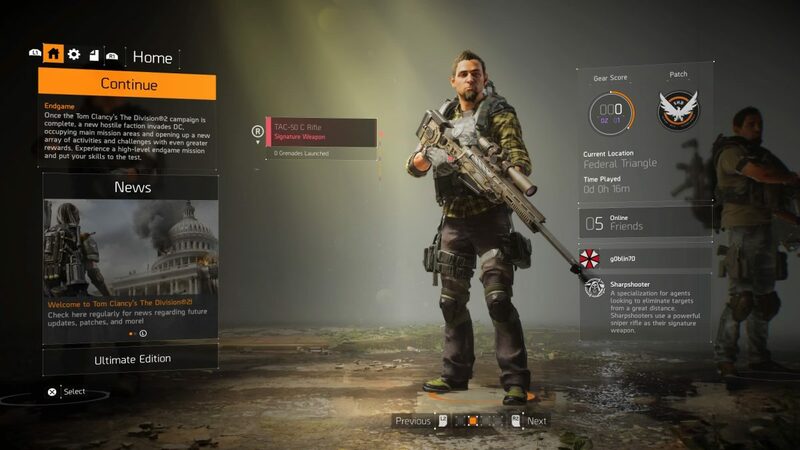 Unlike the original title, you will have the opportunity to embrace a well-defined specialization, each one bearing a unique signature weapon. 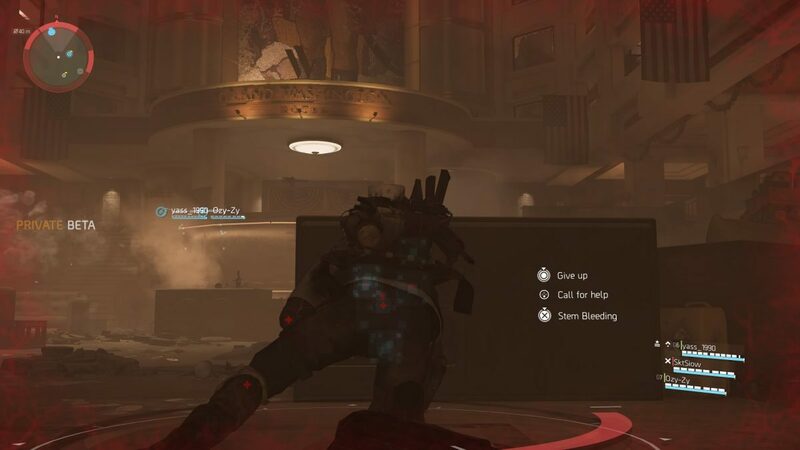 Those specializations are Survivalist, Demolitionist, and Sharpshooter. I tried out this last one, a choice that proved to be not very wise since at that moment I was playing alone. Entering a Hyena’s hideout without adequate firepower is just wishing for death, and so it ended despite a Gear Score well above 300 (my max gear score in the previous game was 284). 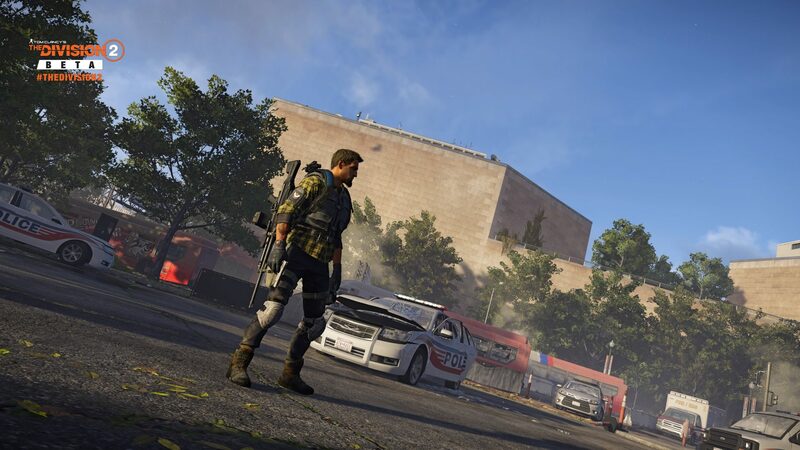 Consistent with the expanded universe, criminal factions are now much more organized (7 months have gone by since the pandemic outbreak) and they now extensively use drones and remote controlled devices of any kind. 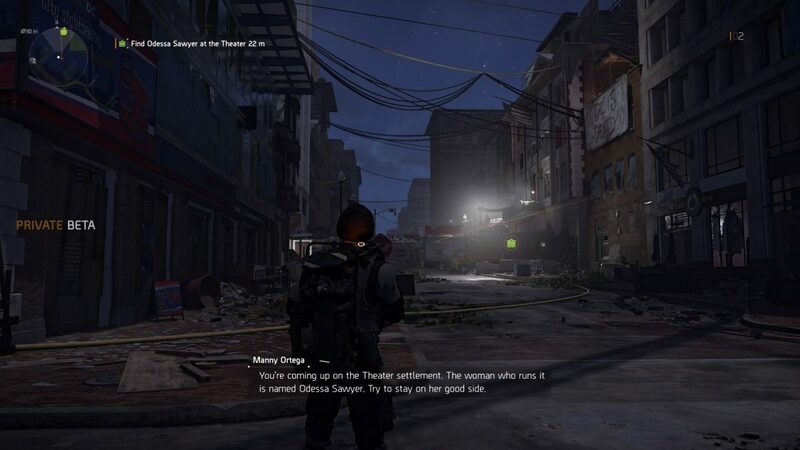 Finally, you will now be able to access three different Dark Zones (only the East one was available in the beta), all of them featuring a different difficulty level. A very appreciated thing is that statistics will be “normalized” upon entering combat, so you shouldn’t run the risk to be “flatted out” by an overwhelming opponent. With the following video, I recorded the very first DZ mission. It acts as a tutorial and does not contain any spoiler, so go on and watch it, if you like. 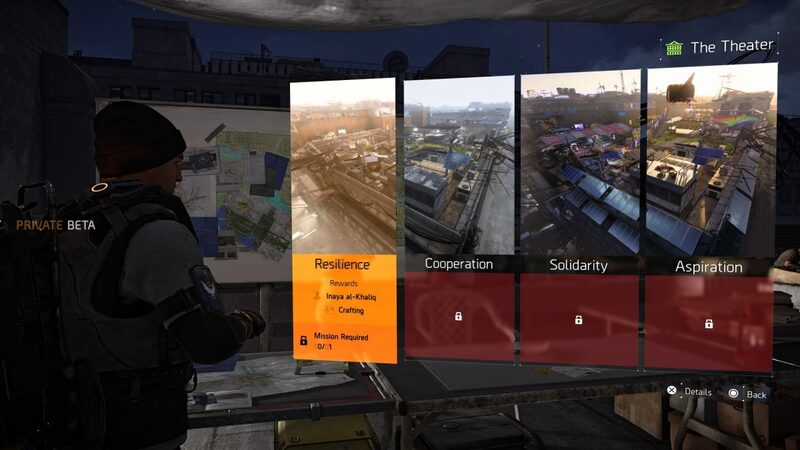 A very appreciated new feature is the possibility to request backup or answer a distress call at any time, without the need to go through a matchmaking process inside Safe Houses or before starting a Main Mission. 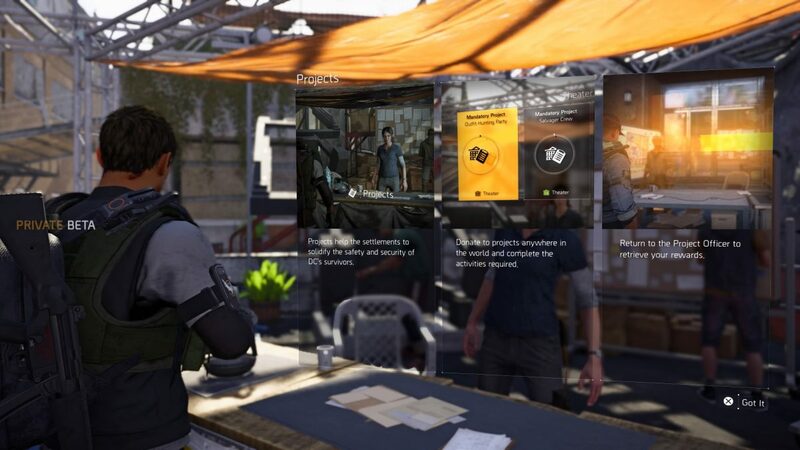 I answered to a few requests during open world roaming and the game swiftly took me inside a different mission, ready to do my part as an Agent. Despite a bumpy start and few glitches that are still present (texture pop-up is still heavy sometimes), my first impression was very positive. What Massive has done so far is nothing short of BEAUTIFUL and, at least for me, March 15th cannot come soon enough. I already logged over 15 hours of active gameplay on this game (more than the entire Leon Kennedy’s and Claire Redfield’s combined campaigns on Resident Evil 2 Remake) and I already know that when times come they will quickly become 150. Possibly more!